Increasingly, transnational corporations, developed countries and private actors are broadening the boundaries of their investments into new territories, in search of a higher return on capital. This growth in direct foreign investment involves serious concerns for both the investor and host state. Various exponents of international civil society and non-governmental organisations persuasively claim that such growth in foreign investments constitutes potential and serious hazards both to the environment and the fundamental rights and freedoms of local populations. 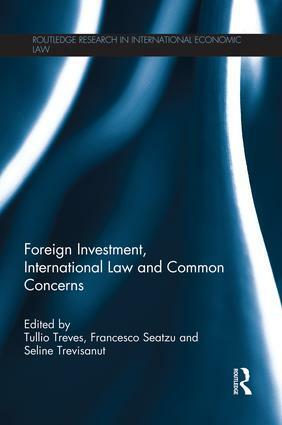 This book explores from an international law perspective the complex relationship between foreign investments and common concerns, i.e. values that do not coincide, or do not necessarily coincide, with the interests of the investor and of the host state. It pays particular attention to the role of the main international development banks in reconciling the needs of foreign investors with the protection of common concerns, such as the environment, human rights and labour rights. Among its collection of essays, the volume asks how much "regulatory space" investment law leaves; whether international investment law is an effective means of balancing contrasting interests, and whether investment arbitration currently constitutes a mechanism of global governance. In collecting the outlooks of various experts in human rights, environmental and international economic law, this book breaks new ground in exploring how attention to its legal aspects may help in navigating the relationship between foreign investment and common concerns. In doing so, the book provides valuable insights into the substantive issues and institutional aspects of international investment law. Mapping Environmental Concerns in International Investment Agreements: How Far Have We Gone?